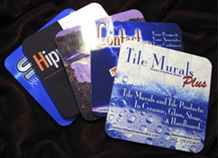 All of Tile Murals Plus’ pricing is “By Quotation” to allow for maximum flexibility. Below you will find our basic pricing for tiles. 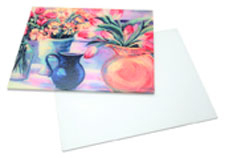 These prices include custom printing of your tiles with digital artwork that you provide to us. 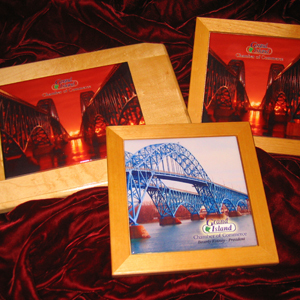 In addition, Tile Murals Plus offers a variety of services from custom art and design to framing. There are also thousands of “public domain”, as well as “stock” images available from scenics to old fashioned fruitbox art. We’ll help you find the image that’s right for you. The bottom line is: We’ll work WITH you! Contact us by phone, “snail-mail”, or on-line form. Once we receive your information, we’ll be pleased to provide a solid quote for your project. White ceramic with generous handle. Additionally, unusual mural configurations (not rectangular or square) may incur an additional setup charge. Note: Above stated sizes are nominal. Actual size of tiles may vary slightly. Above Pricing Based Upon Customer Supplied Digital Artwork in Required Format. We strive for “pleasing color” and, due to our heat/pressure process, cannot guarantee specific color matching. If color or resolution is critical, it is suggested that you order an actual size sample before committing to your full mural project. Custom Art Services, including stock image research, are Additional and will be quoted prior to any work being performed. We accept personal or business checks by mail, or VISA/MASTERCARD by telephone. Payment in full is required at time order is placed. Allow a minimum 2 weeks for delivery after approval of E-Proof. Large orders may require longer. Rush production service is available at an additional charge. NYS Sales Tax (if applicable) is Additional. We respect all copyright laws and may refuse any artwork for any reason. Minimum Tile Orders are: 6″x6″ and smaller – 12 Tiles, 6″x8″ and larger – 4 Tiles. Minimum Order for Glass Tiles is 6 Tiles. Minimum Order for Coasters is 100. Because all of our products are custom, expect delivery in approximately 2 weeks (large orders may take longer) from final OK of your emailed proof and receipt of your payment in full. Our normal shipping is FedX Ground. Other shipping methods or rush shipping and handling may incur additional cost. 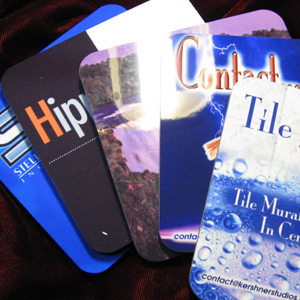 Due to cost considerations and the wide variety of product offered, we can only provide a single, hardboard coaster as a free sample of our process. 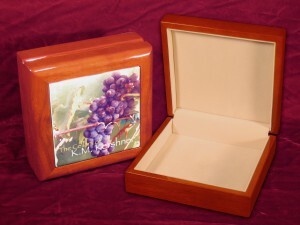 This sample will be imprinted with the image of our choice. Ceramic, tempered glass, and marble tiles are not available as free samples. Please contact us for pricing if you require samples of these products. We strive to offer a “no-surprises” product by e-mailing a sample of actual tile artwork before proceeding with production. This file will show color and resolution (blurriness, if present) to a reasonable extent, keeping in mind that all computer monitors are different, as well as informing you of any additional conditions that may occur due to your chosen substrate, such as “softening” of the image on natural stone tiles. If color or resolution of your artwork is questionable to you, it is suggested that you order an actual size sample on the actual substrate before committing to your full mural project. THIS IS YOUR OPPORTUNITY TO ACCEPT OR REJECT PROCEEDING WITH THE PROJECT. We strive for “pleasing color” and best resolution based upon the artwork provided. Only then do we proceed with production, based upon your acceptance of this e-mail proof and/or the sample. Therefore, it is our policy: that because all of our tile products are manufactured to order, taking reasonable care to involve the customer at every step (see above), our products are non-returnable and non-refundable except for physical damage incurred during shipping. (see below). Upon receipt of your tile product, please inspect immediately for physical damage. We will replace any product damaged due to shipping only if notified of said damage within 3 days of delivery. Tiles damaged during installation are not warranted. No returns accepted without a return authorization. Please call or email for return information, if required. Coasters, mugs, clocks, keepsake boxes, and more allow Tile Murals Plus to offer so much more than just murals. 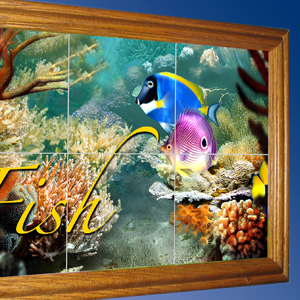 Use a Tile Murals Plus ceramic or glass tile mural as your next fundraising opportunity. You provide the image or graphic, determine the size, style and number of tiles, and we'll do the rest! 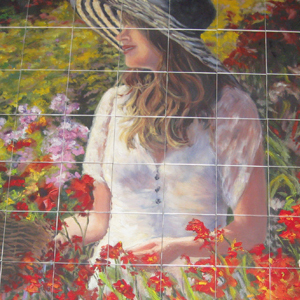 All of Tile Murals Plus murals are custom produced to your specifications. When we say "custom" we really mean it... it's all we do. 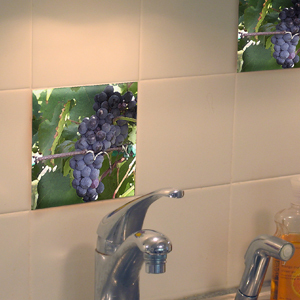 Home decor from Tile Murals Plus offers an exciting way for you to create that one-of-a-kind item that makes your home special. Whether it's one or twenty-one, accent tiles are an exciting way to create interest in an otherwise bland wall, backsplash, or insert. Or... use for your own tile project. 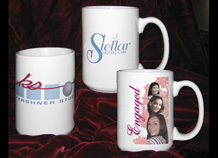 Custom, built to order, items from Tile Murals Plus for the customer who is looking for a bit more.